The roots from the tree usually extend well below and beyond the stump or its’ initial roodt flare, therefore attempting to grind out all of these roots is neither practical nor economical. Grinding the tree stump down to the standard depth of 6-8″ below grade by machine is the best way to get rid of unwanted stumps and is usually satisfactory for replanting grass, flowers, ground covers or most other applications. Whenever possible it is better to plant trees and larger shrubs offset from the original stump area! The Torpy Tree Service standard is to clean-up excess stump mulch/debris and level to grade the remaining stump dirt/debris or if requested by the customer or stated in the proposal cleaning of the stump debris does not have to be the responsibility of Torpy Tree Service Inc. If replanting is required in the same area or more extraction of the stump area is needed we can grind more extensively with our stump machine’s or excavate with a backhoe if required. Upon request we can grind out or remove those unsightly, exposed above grade surface roots outside of the stumps initial root flare. Remember these methods may be considerably more extensive, disruptive to the landscape and can require more restoration, at an additional cost. Per request or as required we can also provide additional soil, sod and installation as needed. 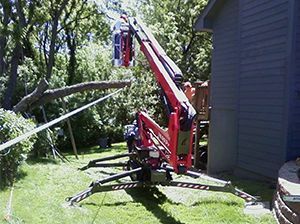 We have the machinery and experience in stump removal services for stumps of all sizes in various locations of your landscape. Also, for your information, an excellent mulch is usually produced from the stump frinding process and may be of value elsewhere in your landscape. Whatever your needs, just let us know and we will do our best to meet them! For stump Removal services, call us today or fill out a form on our contact page. 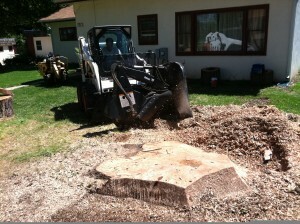 If required in advance we can normally provide you with an approximate estimate for stump removal.